A great way to show your pride in our fellowship of recovery! 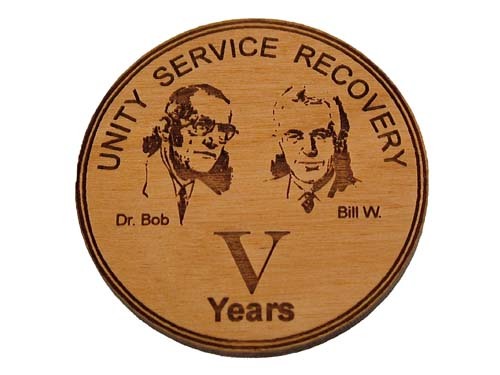 Each wooden medallion features the faces of the Founders, Bill W. and Dr. Bob along with a Roman numeral signifying the number of years the chip holder has been sober. Choose from rich Alder wood (as pictured) or beautiful Maple wood (a lighter colored wood). These unique wooden anniversary medallions are a wonderful way to mark your time or congratulate the accomplishment of someone special to you. 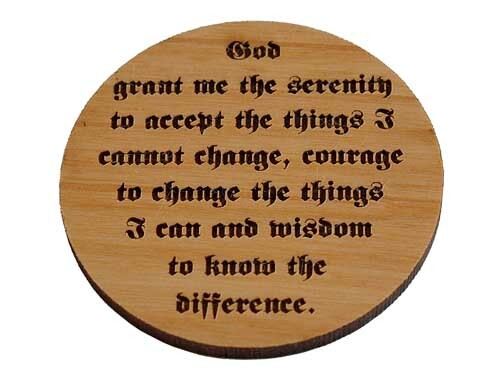 The Serenity Prayer is beautifully laser engraved on the back-side of this Anniversary Medallion. Add a nice Velvet Gift Pouch, too! Makes this unique medallion that much more special! Read more about the History of Recovery Chips and Tokens. I love these... And they always make them fit there medallion holder for me :) you guys ROCK !!!! !